January's a bit crap really, isn't it? 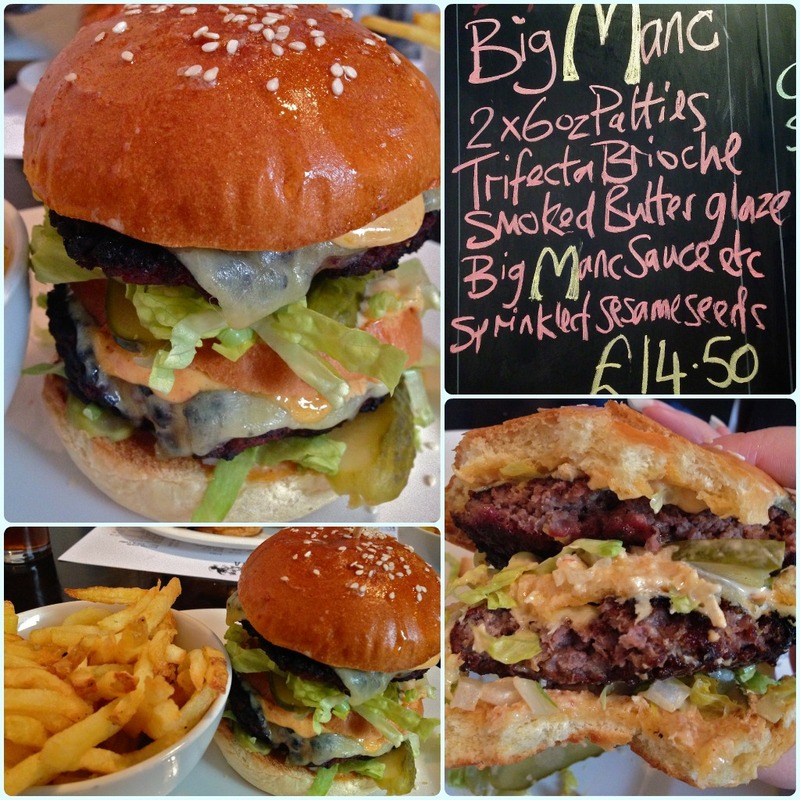 My husband and I officially declared it so and went for a pre-back to work trip to Solita to sample their new special burger, the Big Manc. Imagine the scene. It's the last weekend of my Christmas holidays. I am underwhelmed by the thought of returning to work. My gluttony levels are resting on 'adequate', when we all know that by this point they should be teetering on 'are you having a laugh?' How do we remedy such a situation? A huge burger. That's how. Now I love the Solita KFB, buttermilk chicken burger, and more recently the Breaking Bad burger. 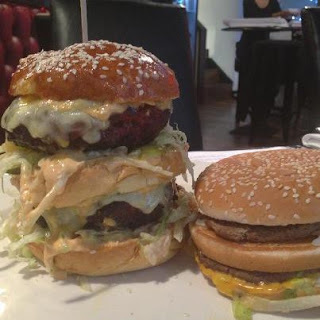 However, I felt that this particular burger needed a blog post all of its very own. Now that's big. I hope that chap with red hair and the ridiculous shoes is listening. This gargantuan specimen was so tall I couldn't get it in my mouth. I tried. It consists of two charred burgers from the Inka grill, shredded lettuce, Big Manc sauce and home made pickles, served on a triple layered brioche bun brushed with smoked butter and sprinkled with sesame seeds. All kinds of special. Although I felt ridiculously full, I was already planning my next one whilst sat in the pub an hour later. Try it whilst you can folks! Did you manage it all?? I left a little bit of one of the patties. Pig. I had to eat it with a knife and fork. I was going to ask if you attempted to take a bite of the whole thing, it's definitely got to be done. Can't wait to finally go, just hoping this or the Breaking Bad burger is on the new menu when I do finally get round to it. I think this is one of those 'try one big bite to get all the flavours and then, after that, tackle with a knife and fork' kind of burgers haha!